As we reported on Friday, the High Court dismissed NZTA’s appeal against the Board of Inquiry decision to decline resource consent for a Basin Reserve flyover. There was a lot of media reaction to this decision – below is a selection. The High Court this afternoon dismissed the New Zealand Transport Agency’s appeal against the 2014 Board of Inquiry decision to decline resource consent for a Basin Reserve flyover. Naturally, Save the Basin is delighted! Below is our press release from earlier this afternoon – check out all the coverage and reactions to the decision on Wellington Scoop. The Save the Basin Campaign today said that it was delighted the High Court had rejected the New Zealand Transport Agency’s appeal of the 2014 Board of Inquiry decision to decline resource consent for a Basin Reserve flyover. Save the Basin Campaign spokesperson Tim Jones said that the Campaign was confident the Board of Inquiry decision would stand up under the High Court’s scrutiny, and that the Transport Agency had failed to mount a strong case. He also thanked Matthew Palmer QC, who appeared for Save the Basin at the High Court, and Nathan Ross, who assisted. 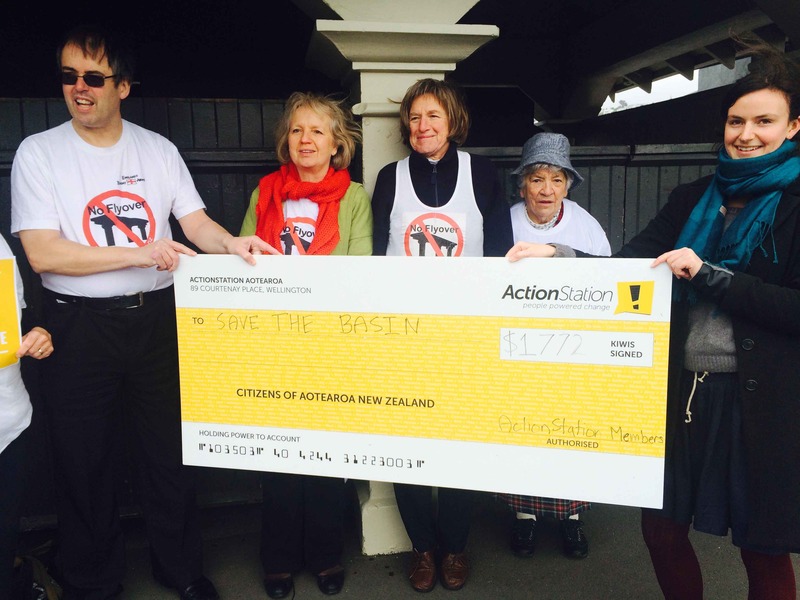 As Wellington Scoop has reported, Community campaigning group Action Station has made a vital contribution to the campaign to save the Basin Reserve from a massive motorway flyover which the New Zealand Transport Agency wants to build there. Despite a Government-appointed Board of Inquiry ruling in 2014 that a Basin Reserve flyover should not go ahead, the New Zealand Transport Agency took the matter to the High Court in July, attempting to overturn the Board’s decision. 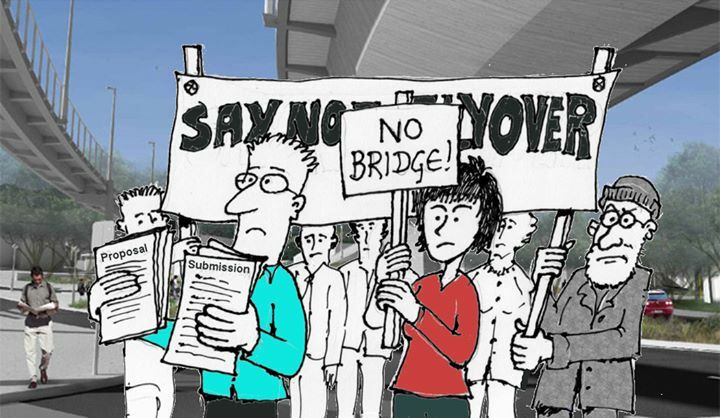 NZTA is able to spend millions of dollars in taxpayer money to pursue its flyover obsession, which puts community groups such as the Save the Basin Campaign and the Mt Victoria Residents’ Association, which jointly opposed NZTA’s appeal in the High Court, at a huge financial disadvantage. Fundraising through Action Station raised close to $2000 for the legal fund. The cheque handover took place at Tuesday lunchtime at the northern entrance to the Basin Reserve, near where NZTA wants to impose the flyover monstrosity. The High Court hearing on NZTA’s appeal finished on 31 July, and the hudge’s verdict is now awaited.